This exclusive canvas print of The O’Rahilly is only available through Avoca Gallery and is the perfect gift for everyone with an Irish connection. 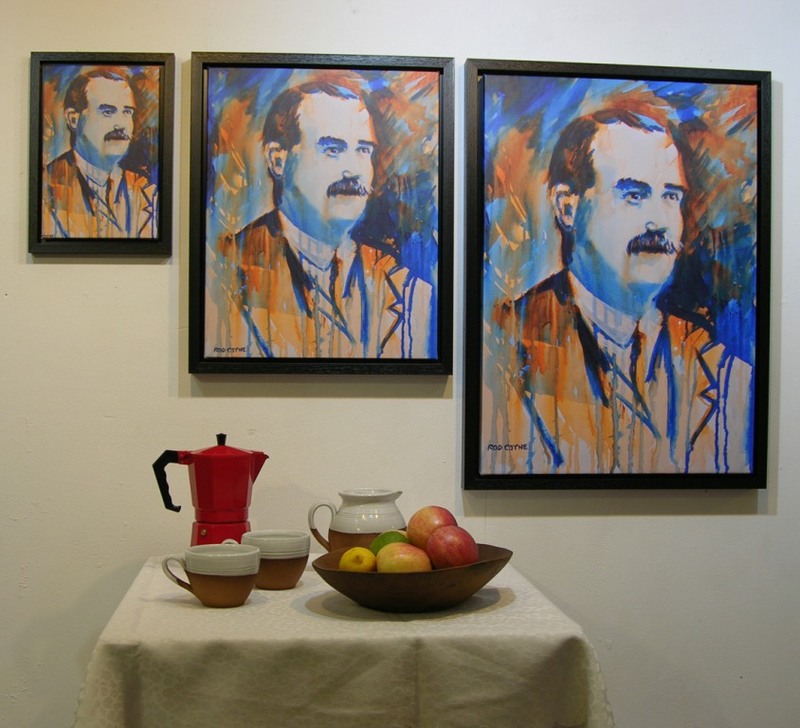 The O’Rahilly 1916 Canvas Print belongs to a series of sixteen 1916 portraits created by Rod Coyne to mark the Easter Rising Centenary. This fine art print available in small, medium and large sizes. It is framed and the price includes FREE world wide delivery. Michael Joseph O’Rahilly (Irish: Mícheál Seosamh Ó Rathaille or Ua Rathghaille); (22 April 1875 –29 April 1916) known as The O’Rahilly, was an Irish republican and nationalist; he was a founding member of the Irish Volunteers in 1913 and served as Director of Arms. Despite opposing the action, he took part in the Easter Rising in Dublin and was killed in a charge on a British machine gun post covering the retreat from the GPO during the fighting. The O’Rahilly original photographic portrait. Born in Ballylongford, County Kerry, O’Rahilly was educated in Clongowes Wood College (1890-3). As an adult, he became a republican and a language enthusiast. He joined the Gaelic League and became a member of An Coiste Gnotha, its governing body. He was well travelled, spending at least a decade in the United States and in Europe before settling in Dublin. O’Rahilly was a founding member of the Irish Volunteers in 1913, who organized to work for Irish independence and resist the proposed Home Rule; he served as the IV Director of Arms. He personally directed the first major arming of the Irish Volunteers, the landing of 900 Mausers at the Howth gun-running on 26 July 1914. 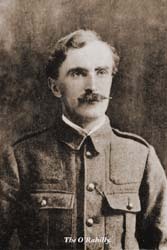 O’Rahilly was not party to the plans for the Easter Rising, nor was he a member of the Irish Republican Brotherhood (IRB), but he was one of the main people who trained the Irish Volunteers for the coming fight. The planners of the Rising went to great lengths to prevent those leaders of the Volunteers who were opposed to unprovoked, unilateral action from learning that a rising was imminent, including its Chief-of-Staff Eoin MacNeill, Bulmer Hobson, and O’Rahilly. O’Rahilly took instructions from MacNeill and spent the night driving throughout the country, informing Volunteer leaders in Cork, Kerry, Tipperary, and Limerick that they were not to mobilise their forces for planned manoeuvres on Sunday. He fought with the GPO garrison during Easter Week. On Friday 28 April, with the GPO on fire, O’Rahilly volunteered to lead a party of men along a route to Williams and Woods, a factory on Great Britain Street (now Parnell Street). A British machine-gun at the intersection of Great Britain and Moore streets cut him and several of the others down. O’Rahilly slumped into a doorway on Moore Street, wounded and bleeding badly but, hearing the English marking his position, made a dash across the road to find shelter in Sackville Lane (now O’Rahilly Parade). He was wounded diagonally from shoulder to hip by sustained fire from the machine-gunner. The memorial in O’Rahilly Parade, Dublin. In Gaelic tradition, chief of clans were called by their clan name preceded by the determinate article, for example Robert The Bruce. O’Rahilly’s calling himself “The O’Rahilly” was purely his own idea. In 1938, the poet William Butler Yeats defended O’Rahilly on this point in his poem The O’Rahilly.